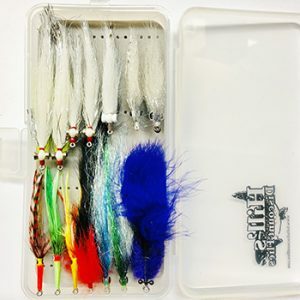 This is a Mayfly Dry Fly package that comes in a waterproof box. You get the following flies with this package. Adams, Adams Parachute, BWO, BWO Parachute, Cahill, Cahill Parachute, Callibaetis Parachute, Almost Dun, PMD, PMD Parachute, Purple Haze, Purple Haze Foam Parachute, Red Quill, Gordon Quill, Sulphur Dun and Sulphur Parachute.